One of the largest maintenance issues associated with belt conveyors is belt tracking. Belt tracking is the adjustment method used to keep the belt running straight and true on the end rollers and the belt conveyor frame. There are many factors that can affect belt tracking. These include; belt splicing accuracy, conveyor roller accuracy, roller size, proper belt tension, side loading on the conveyor belt from pushing product on or off the belt and build up on conveyor roller from the debris. 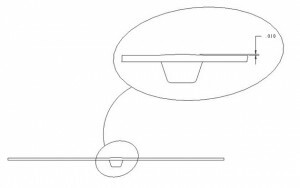 Conveyor design can aide greatly in minimizing the issues associated with belt tracking. The (2) most common methods used to aide in the belt tracking are crowned roller and v-guided belting. A crowned roller is a drive drum with a cylindrical center section with (2) tapered sections on each end. The length of the tapered section is generally ½ the length of the cylindrical center section. Adjustment is still recommended to tune in the crowned roller due to compensating for production tolerances of the conveyor and the belt. See the image below for typical recommendations for the taper specifications. This method works by the taper sections of the roller steering the running conveyor belt to the center to the roller. This is however not exact. Due to the tolerance of the belt splice, the accuracy of the belt conveyor frame, and weave of the belting the conveyor belt will drift back and forth across the face of the roller. On larger rollers a drift of +/- ½? can be expected. 1. Works will most belts. Most conveyor belt manufacturers assume some method of roller crowning will be used to aide in belt tracking. Most belts will accept a modest level of crown without adversely effecting belt wear. 2. Can be used with Knife edge idler transfers. Knife edge idler transfers are small diameter idler rollers used to transfer small or delicate parts on or off the belt conveyor. This transfer method requires a belt that is flexible enough to go around rollers as small as ¼? diameter. Typically belts of this type are compatible with crowned roller tracking. 1. There is no control over the belt on the conveyor bed. Crowned roller belt tracking is only done at the end rollers of the conveyor. Therefore the belt in the center of the conveyor is not controlled and free to move side to side. If side forces are placed on the belt due to product issues added belt steering mechanisms are required to hold the belt within the conveyor frame. 2. Excessive Belt drift cause frames to be much wider than the belt. Due to the tolerance of the belt splice, the accuracy of the conveyor frame, and weave of the belting the conveyor belt will drift back and forth across the face of the roller. On larger rollers a drift of +/- ½? can be expected. This then requires the roller width and frame width to be much wider than the belt, as shown in Figure 3. Therefore the conveyor takes up valuable floor space and more importantly can cause an operator pinch point/safety issue as the belt enters the roller. 3. Difficult to add traction surface to carry higher loads. The most common methods of traction surfaces on conveyor rollers are lagging and knurling. Lagging is the process in which a urethane sleeve is pushed over the outer surface of the drive roller. Crowned rollers do not work with this method. Knurling is a method of machining in the metal roller a pattern of diamond shape or straight shaped edges to bite into the bottom surface of the conveyor belt. On a crowned roller this method can only be done on the straight portion of the roller limiting the load capacity of the belt conveyor. 4. Difficult to transfer small or odd shaped product. The addition of the crown or taper on the conveyor roller causes the roller to not be flat. In the case where the product to be moved or transferred is unstable or top heavy, a roller than is not flat can cause instability at the transfer. To solve this issue a more expensive nose roller or knife edge transfer is needed. 5. Use larger diameter roller to accommodate taper. The addition of the taper or crown adds to the roller diameter. In larger diameter rollers this can add as much as a ¼? to the diameter. In cases where product transfer is key, a larger diameter roller can have negative results. V-guided belting is accomplished by bonding a continuous plastic ?V? shaped material to the back side of a conveyor belt. This ?V? guide then fits into a ?V? groove that is cut into the end roller and the bed plate of the conveyor. This fit is what holds the belting in place across the width of the conveyor and keeps the belt tracked. See Figure 4 below for typical v-guide installations. Figure 4. V-Guided Belting and Drive Roller. Typically the material for the V-guide is Urethane or PVC. For the best bond between the v-guide and the base belting the material of the v-guide should match the skim coat of material on the belting. This may limit the available belts than can be v-guided. Examples of belts that can not be v-guided are; Teflon, polypropylene, and silicon based belts. These are specialty materials used for very specific applications such as high temperature and food product release. In general PVC and Urethane based belting covers the majority of conveying applications. The bond of the v-guide to the base belt is critical. It is achieved through the proper use of materials, heat and bonding agents. In testing a quality bond, when the v-guide is pealed back the base belt would tear before the bond between the v-guide and the belt. 1. Provides belt tracking throughout the length of the conveyor bed. 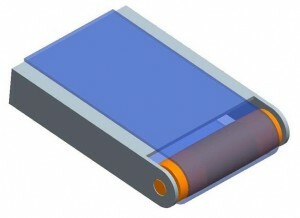 Typically the same v-groove shape that is put into the end roller can be put into the conveyor frame. This grove then provides side-to-side tracking of the conveyor belt along the entire length of the conveyor. An example is shown in Figure 6 below. Figure 6. V-guide tracking along the length of the conveyor frame. 2. Tight frame width to belt width dimensions can be held. The fit between the v-guide and v-groove in the roller is close. Generally, there is about 1/16? gap. 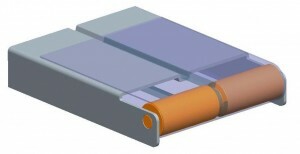 This provides tight control of the belt and therefore little extra room is needed in the conveyor frame for belt drift. 3. Very robust tracking method. A v-guided belt riding in a grooved roller is a positive engagement system. It takes severe misalignment to drive the v-guide out of the groove. 4. Multiple traction surface options. The drive roller in a v-guided application remains flat. With this, there are no limitations in options for providing traction surfaces such as lagging, knurling or grooving. 5. Straight roller provides consistent transfer for small or odd shaped product. In a v-guided conveyor, the drive roller is straight. This provides a consistent and level surface for transfer of small or odd shaped products. 1. Limits the types of belt materials. Examples of belts that can not be v-guided are; Teflon, polypropylene, and silicon based belts. These are specialty materials used for very specific applications such as high temperature and food product release. In general PVC and Urethane based belting covers the majority of conveying applications. 2. The belt is not completely flat. Heat is applied during the process of bonding the v-guide material to the base belt. This heat may deform the top surface of the base material as shown in Figure 7 below. If done properly this deformation will be minimal. Typically less than 0.010?. While this deformation flattens out while the belt is tensioned over the end rollers it is, however, this deformation is evident in the flat portion of the conveyor. This slight raised deformation could cause issue with very light products not sitting flat on the belt surface. Figure 7. Top surface of V-guided Belt. 3. Can not be used with Knife edge idler transfers. Knife edge idler transfers are small diameter idler rollers used to transfer small or delicate parts on or off the conveyor. This transfer method requires a belt that is flexible enough to go around rollers as small as ¼? diameter. The v-guided belt can not run on this size of roller. 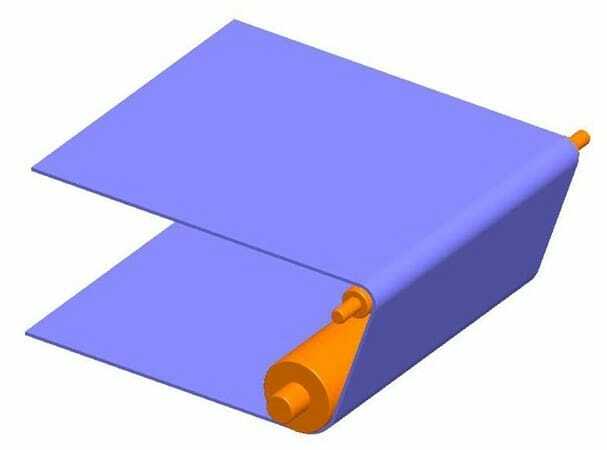 Typically the smallest roller to accept a v-guided belt is approximately 1? in diameter. Many of today’s conveyor applications are running 24/7. In these and all applications minimizing conveyor maintenance is critical. Providing technologies that improve the time between maintenance cycles then becomes critical. In the comparison of V-guided tracking versus Crowned pulley tracking it can be seen that the V-guide technology greatly improves the features than minimize maintenance. The only short coming is the availability of belting materials and the use of nosebar transfers. These requirements while important, are a very small percentage of the conveyance applications. 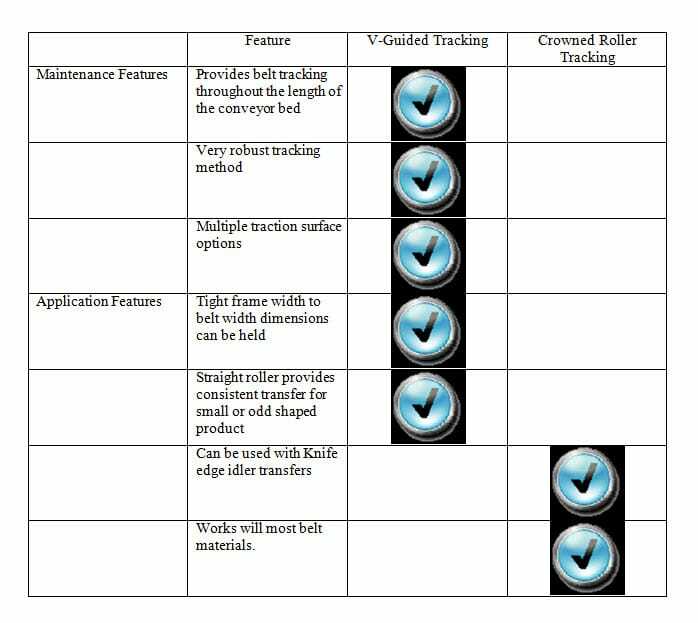 Therefore for improved maintenance on the majority of conveyance application v-guided belt tracking would be preferred.